The mission of the IQ Center is to foster cross-disciplinary and quantitative approaches to inspire creativity and problem solving in teaching and research. The Center will help prepare undergraduates to become leaders in science and math careers, as well as to produce scientifically curious and literate leaders in society, regardless of career emphasis. The center is home to sophisticated imaging and computational instruments, including confocal and scanning electron microscopes, and a powerful 3D imaging lab. 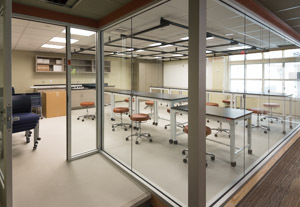 In addition, a Physical/Mechanical Lab and technology-rich teaching and meeting spaces serve to engage students in a flexible, active hands-on learning environment. A state-of-the-art collaborative teaching and learning space that fosters interdisciplinary research. Check out all the facilities available on the second floor of the Telford Science Library. From high-speed cameras and state-of-the-art 3D printers to some of the most advanced research microscopes, the IQ Center has it all. Check out the amazing equipment that is available! We provide work-study and non work-study employment to students throughout the year. Come explore the IQ Center and see if you want to learn to use the state-of-the-art technologies, while getting paid! We don't have all the advanced facilities just to show off! Faculty, staf, and students can reserve the facilities for their use. All you have to do is let us know in advance by making a reservation!